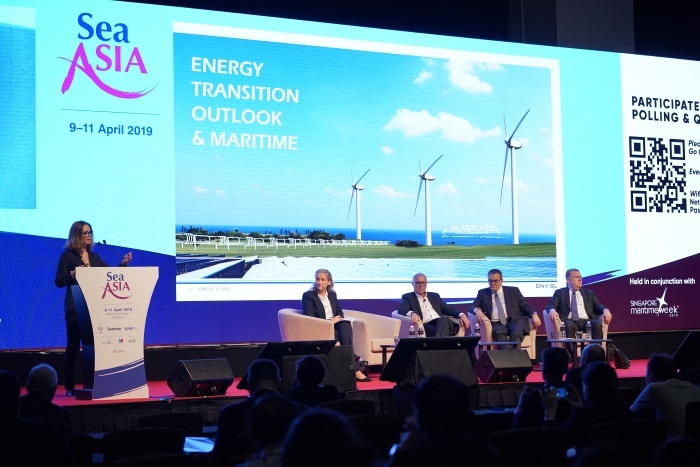 Kicking off the third and final day of the Sea Asia 2019 conference, industry leaders from across the energy supply chain came together to discuss what the push for alternatives to fossil fuels means for the maritime industry. Katharina Stanzel, Managing Director of INTERTANKO moderated the panel discussion with Geir Bjørkeli, Chief Executive Officer at Corvus Energy; Liv Hovem, Chief Executive Officer at DNV GL – Oil & Gas; Neil McGregor, Group President and Chief Executive Officer at Sembcorp Industries; and, Dr George Pateras, President of Hellenic Chamber of Shipping and Hellenic Maritime Cluster, and Deputy Chairman of Contships Management Inc.
Left to right: Liv Hovem, Chief Executive Officer at DNV GL – Oil & Gas, Katharina Stanzel, Managing Director of INTERTANKO, Neil McGregor, Group President and Chief Executive Officer at Sembcorp Industries, Dr George Pateras, President of Hellenic Chamber of Shipping and Hellenic Maritime Cluster, and Deputy Chairman of Contships Management Inc; and Geir Bjørkeli, Chief Executive Officer at Corvus Energy. Ms Hovem lead the discussion by highlighting the global shift away from fossil fuel use, saying that by 2050 the world is projected to use a 50-50 mix of fossil fuel and non-fossil fuel energy resources, a large jump from the current split of 80-20. Specifically, for the maritime industry, a possible energy future to meet the IMO targets is that 39 per cent of shipping energy will be supplied by carbon neutral fuels by 2050, due to the increased use of renewables and a combination of carbon capture and storage (CCS), over traditional heavy fossil fuel oils. Looking at what this means for the maritime industry, the panel agreed that the use of battery power will be more widespread among companies. Batteries will not only complement engines on board but also reduce energy wastage across the industry. Mr Bjørkeli highlighted the benefits, notably that batteries result in safer and more efficient shipping as a more reliable power source, with enhanced power and less instances of blackouts, enabling certain ships to react quickly to unforeseeable circumstances. The panel discussed the key drivers of the change in energy mix and pointed to not only regulation and funding, but also to the younger generation who is more mindful of the environment. They see the millennial generation's increased awareness of the world they live in and the need to adopt sustainable practices, as the ultimate drivers of government policy and regulation, and the shift towards environmental funding requirements. Mr McGregor made a clear statement that climate change is here and that the industry must do something about it. He acknowledged that while increased regulatory and government policies will steer change, companies also need to set targets for themselves. He said that setting targets, as well as challenging teams to come up with innovative ways to use technologies to achieve them, are some of the most effective ways to bring about change. The panel was unanimous on one point – every government, industry, company and individual has to take action. Using an imperfect solution for a more efficient and sustainable business is better than waiting for the perfect solution, because there is not enough time to wait. Particularly for the shipping and maritime sector, if companies wait, they will fail to exist in the future. 12/04/2019 00:00 - Shipping and The Need for Environmental Protection: Can They Work In Tandem?